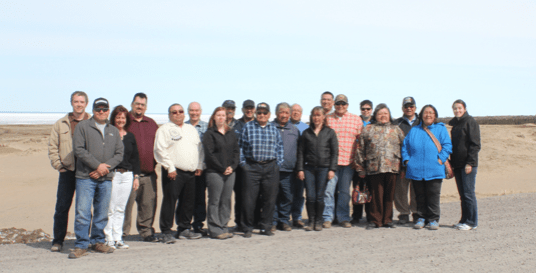 Kuujjuarapik, QC, May 28th 2014 – The Aboriginal Roundtable is pleased to report that their fourth meeting held in Whapmagoostui – Kuujjuarapik on May 21st and 22nd, 2014 was a success and good progress is being made towards the conservation of Ungava caribou. Since the inaugural meeting of the UPCART in January 2013 in Kuujjuaq, great efforts have been made by the members to develop their own conservation measures and actions while ensuring that the cultural and spiritual relationship with caribou and the food security of members are respected. These efforts reported by the Aboriginal Groups at the Round Table have resulted in a reduction of the hunting pressure from the UPCART members on the George River Herd, which is in a critical state. “In the 18 months since the inaugural meeting, members of UPCART continue to build their relationship and strengthen the trust around the table. This is leading to real results, and I have faith that we will achieve a true model of leadership in managing Ungava Caribou”, Sarah Leo, President of the Government of Nunatsiavut and Co-Chair of the UPCART. Discussions regarding access to the Leaf River Caribou Herd by the members of the UPCART were also held, as the members reiterated the need to find alternate means to access this important food source while being respectful of the well-being of the communities, their populations and their territorial responsibilities. “Sharing is a strong cultural value for our Peoples, and it is important to come to an agreement between the members on how we can ensure our collective food security and maintain our cultural relationship while protecting and conserving the Ungava Caribou” Adamie Delisle-Alaku, Vice-President, Renewable Resources, Makivik Corporation and Co-Chair of the UPCART. The UPCART is also continuing its work in developing a conservation plan for the Ungava caribou herds that will be based on preserving the Aboriginal relationship and respect for caribou. Finally, the UPCART also acknowledges the work of the Torngat Wildlife, Plans and Fisheries Secretariat, who attended the meeting and provided good insights and recommendations for the management of the Ungava Caribou Herds. The Ungava Caribou Aboriginal Round Table membership is: the Inuit of Nunavik, the Inuit of Nunatsiavut, the NunatuKavut Community Council, the Naskapi Nation of Kawawachikamach, the Grand Council of the Crees of Eeyou Istchee/Cree Regional Authority (GCCEI/CRA), the Innu Nation of Labrador and all the Innu communities from the Québec region.